Jussie Smollett‘s first interview since his attack in Chicago last month will air on ABC this week and a new teaser shows him breaking down in tears as he relives the ordeal. The Empire actor’s interview with ABC’s Robin Roberts will air Thursday on Good Morning America. 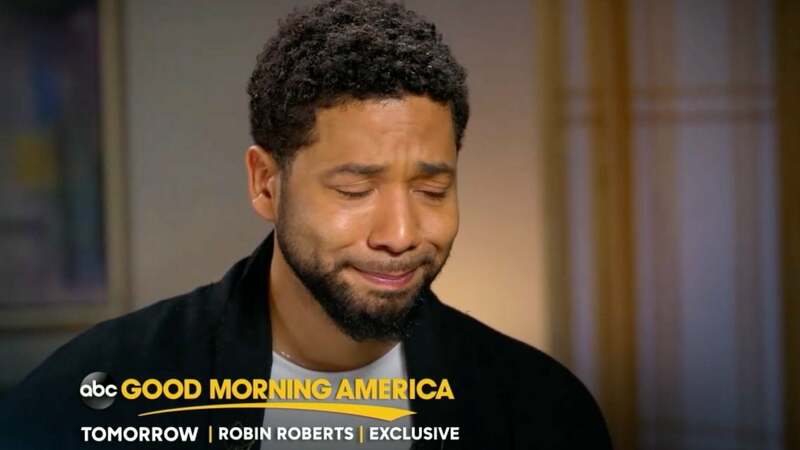 In a short promo for the sit down, Smollett can be seen tearing up after Roberts asks him if he feared for his life at any point during the alleged hate crime. This will mark the first time the 36-year-old answers questions on camera about the incident which made headlines and dominated social media feeds. Initially, Smollett received an outpouring of love and support from both fans and celebrities in aftermath of the attack. The public seemed to stand by him while condemning the violent discrimination that he was subjected to. And Chicago Police launched a manhunt for the attackers who shouted, “This is MAGA country!” after punching his ribs, pouring bleach over his head and tying a noose around his neck. But some people began to question if the alleged assualt was too sensational to be true. Despite many people’s inability to accept the details of the assault, Tuesday night, a spokesman for the actor issued a statement which reads: “Jussie is the victim here, which has been stated by the Superintendent of Police.